Today, organizations of all sizes recognize the value of an agile software delivery process. Agility is the foundation for cost–efficiency, competitiveness, high team morale and customer satisfaction. Yet most organizations face an agility paradox in that the more agile their software delivery workflow becomes, the higher the risk that instability or unpredictability will be introduced and undercut the investment they make in software production. Fortunately, there is a solution to this conundrum. It’s called shift–left monitoring, and it allows your company to maximize agility in software delivery without assuming undue risks. 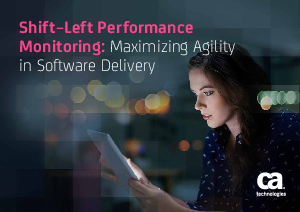 This e–book explains how you can achieve agility and stability at the same time to streamline the path to digital transformation and innovation by shifting monitoring to the left of your software delivery workflow.